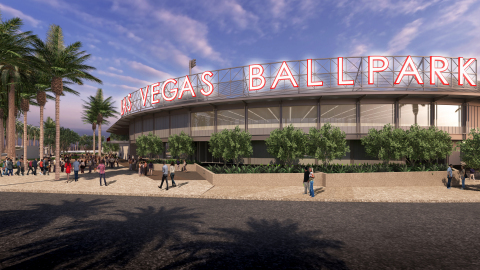 LAS VEGAS--(BUSINESS WIRE)--The Howard Hughes Corporation® (NYSE: HHC) announced today its plans to develop and construct a baseball stadium in Downtown Summerlin® on approximately eight acres just south of City National Arena, the National Hockey League practice facility for the Vegas Golden Knights. 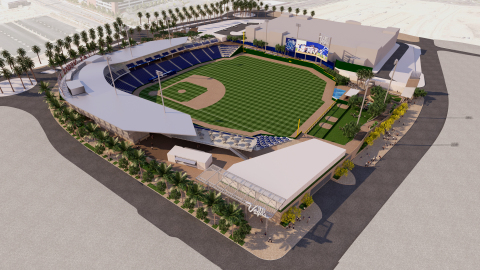 The new stadium, to be named the Las Vegas Ballpark, will be the future home of the Las Vegas 51s, the city’s professional baseball team. The team, a member of the Pacific Coast League (PCL) and a Triple-A affiliate of the New York Mets, is wholly owned by The Howard Hughes Corporation, which acquired full ownership interest earlier this year. Today’s announcement followed a vote by the Las Vegas Convention and Visitors Authority Board of Directors approving a marketing partnership that gives LVCVA naming rights to the stadium. 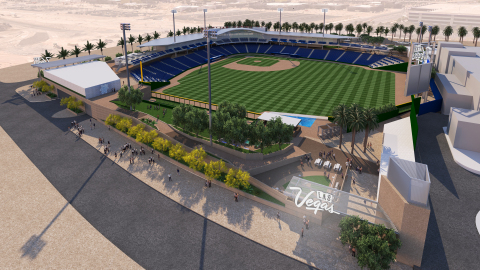 In addition to serving as the home of the Las Vegas 51s, Las Vegas Ballpark will host civic, community, nonprofit and sporting events. The Las Vegas Ballpark is being designed by HOK, a global architecture firm with an expertise in stadium design, having designed more than 40 professional and collegiate stadiums worldwide. The 10,000-fan-capacity stadium blends the distinct architectural style of the Summerlin® community with the aviation legacy of Howard Hughes. The ballpark will provide a wide range of seating options including 22 suites, club seats, berm seating, party zones and decks, picnic tables, kids’ zone, bars and even a pool beyond the outfield wall. Designed to create a festival-like atmosphere in Downtown Summerlin, the site will be landscaped to complement the master planned community. Parking will be conveniently located on adjacent sites. Developed by The Howard Hughes Corporation®, Summerlin began to take shape in 1990 and has ranked in the country’s top 10 best-selling master planned communities for nearly two decades. Located along the western rim of the Las Vegas valley, Summerlin encompasses 22,500 acres with approximately 6,000 gross acres still remaining to accommodate future growth, including infrastructure, open space and common areas, all within the master plan. The community is currently home to more than 100,000 residents who enjoy an unparalleled list of amenities. These include more than 250 neighborhood and village parks, more than 150 completed miles of trails, 25 public and private schools, 14 houses of worship, nine golf courses, shopping centers, medical and cultural facilities, business parks and dozens of actively selling floor plans. Homes are available in a variety of styles – from single-family homes to townhomes– priced from the $300,000s to more than $2.5 million. For information on custom homesites in The Ridges please call 702.255.2500. Visit www.summerlin.com for more information. Downtown Summerlin includes retail, entertainment, office, hotel and multi-family residential elements, all designed to create a vibrant, walkable urban core within the award-winning 22,500-acre master planned community of Summerlin®. Downtown Summerlin totals nearly 400 acres between Charleston and Sahara and features more than 115 stores and restaurants in a streetscape-shopping environment with pedestrian thoroughfares and dynamic storefronts. The first phase of development opened to the public in October 2014. In 2016, The Constellation, a luxury multifamily development opened with 124 new residences and Las Vegas’ first NHL franchise team’s practice facility opened earlier this year. Located just east of the 215 Beltway, between Sahara Avenue and Charleston Boulevard, the development also includes a nine-story office building, ONE Summerlin. Additional information can be found at www.downtownsummerlin.com. The Howard Hughes Corporation owns, manages and develops commercial, residential and mixed-use real estate throughout the U.S. Our properties include master planned communities, operating properties, development opportunities and other unique assets spanning 14 states from New York to Hawai‘i. The Howard Hughes Corporation is traded on the New York Stock Exchange as HHC with major offices in New York, Columbia, MD, Dallas, Houston, Las Vegas and Honolulu. For additional information about HHC, visit www.howardhughes.com. The Las Vegas 51s have the proud distinction of being the longest enduring franchise in the history of professional sports in the state of Nevada. The 2017 campaign marked the 35th season in the Silver State as a proud member of the Pacific Coast League. The Stars/51s have reached the 300,000 mark in “home” attendance at Cashman Field in 35 consecutive seasons (1983-2017). The 51s are the Triple-A affiliate of the New York Mets and the franchise won the PCL championship in 1986 and 1988.